Drugs are a frequent cause of both in-hospital and community-acquired acute kidney injury (AKI). 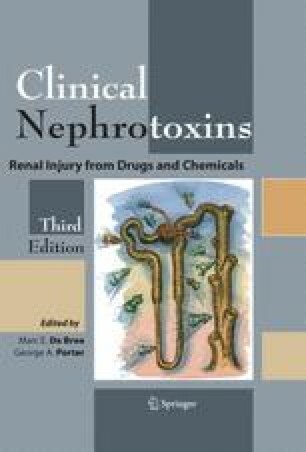 Nephrotoxic drugs share the spotlight with renal hypoxia as primary etiologic factors for hospital acquired AKI [1,2,3]. With the increasing capacity of the medical community to treat the most serious life-threatening conditions, the in-hospital exposure to nephrotoxic drugs has increased as has the risk of drug-induced AKI, while the expanded drug treatments available for outpatient use is contributing to the rise in community acquired AKI. Acute kidney injury (AKI) is easily defined as a syndrome characterized by a sudden decrease in GFR accompanied by azotemia . However; the reported incidence of AKI varies depending on a number of independent variables. For example, was the patient population surveyed derived from a community wide database or was it restricted to hospitalized patients? What definition was adopted to designate acute kidney injury (AKI)? The lack of a universally agreed upon definition of acute kidney injury (AKI), makes it difficult to compare clinical reports as to the incidence, severity and outcome. Recently, the Acute Dialysis Quality Initiative  has attempted to address this issue involving both nephrologists and critical care physicians in the discussion. Success of this project is critical for it will allow the sharing of information regarding interventions which, in turn, will improve the dismal outcomes that currently exist for patients with acute kidney injury. This dismal outcome is especially true if the patient suffers from the constellation of multiple organ failure which is becoming common place in ICUs. Encouragement comes from the success of the KDOQI classification of Chronic Kidney Disease (CKD)  that is being adopted world wide and allows consistent stratification based on glomerular filtration rate (GFR) .